My wife and I live in Wash Park and own the Great Harvest Bread Co. of Denver at 765 South Colorado Boulevard. We’ve been honored to bake bread for our neighbors for fifteen years. That’s all about to change. If you think of our bakery as a brick and mortar retail business where you get your 100% whole grain bread, sweets and sandwiches, then I have disappointing news for you. That portion of our business – that part where we make stuff and you give us money for it – is almost over. Our lease expires at the end of February, and our landlord, Kroger, will not renew. After two years of unsuccessful efforts to sell and move our bakery, our last day selling bread will be February 23rd. If your view of our relationship is transactional and singular, I am sorry. The end is upon us. However, if you think of our business as a relationship built on community, trust and love, I have something very exciting to explain. Our business is not ending. Not by a long shot. In fact, our business is expanding from our tiny wedge of a run-down old strip-mall to a solution to the needs of thousands of our Denver neighbors. And you can be as big a part of our business as ever. As we approach the end of February and the end of our lease, we have analyzed the value of our bakery equipment. If we sell each piece of equipment individually and patiently on ebay and craigslist, we can expect a minimum of $30,000. It will be an arduous process that will feel like a slow death to the business we nurtured and loved for fifteen years. We have a better idea. This is where you come in. Project Restart – This is a rapid re-housing program for our Denver neighbors experiencing homelessness. Located on the Southwest side of town, Project Restart will provide inexpensive housing, food, job training and mental health and addiction services for our neighbors in need of a little help to get back on their feet. We want to donate bakery equipment to their kitchen to feed their residents and to be used in culinary job training. UCCS Grain Project – Our food system is broken, and the folks at the Grain Project are reintroducing heirloom wheats and ancient grains into our restaurants and grocery stores. They have farmers who are eager to help. They have bakers who love to make bread with their grain. They do not have an efficient way to grind grain into flour…at least not yet. We want to donate our stone mill to help the Grain Project grind their life-nurturing flour. SAME Cafe – So All May Eat Cafe doesn’t bring a bill when its patrons finish their meal. If you can afford to pay for your meal, they are thankful for the donation. If you pay for your meal and then some, now you are part of their community where those who can afford it support meals for those who can’t. It is a remarkable concept, and we want to help them expand into baking their own bread. They would like our massive mixer, and we very much want them to have it. And this is just a start. We hope to donate our bakery equipment to Denver Public Schools, Focus Points Family Resource Center, We Don’t Waste, and many other organizations making a difference in our community. Nothing will bring us more happiness in this dark hour than to bring hope to the lives of those in need. But the reality of the situation is that we cannot afford to simply walk away from the $30,000 value of our equipment. At least not all of it. This is your part. We need you to bring this plan to life. We want to split this donation with you, our loyal customer and generous neighbors. You, our friends. We are calling it, “Feed the Knead,” and we are asking for contributions to mitigate the financial impact of our $30,000 donation. For every dollar you donate to Feed the Knead, we will donate two dollars worth of our equipment. 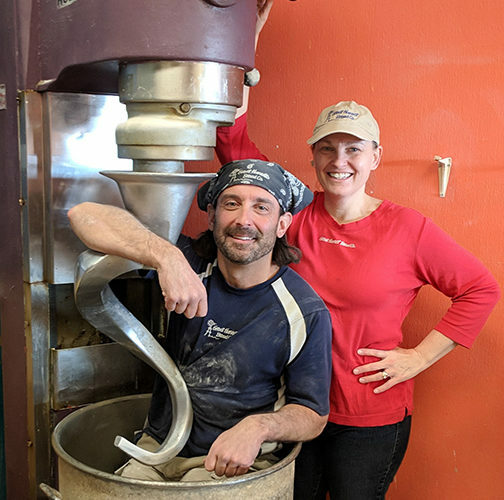 If we can raise $15,000 for this project, every piece of our bakery equipment will go to good use by good people working to improve our community. Please help us prove we have the most caring and generous friends in Denver. Please donate to Feed the Knead today. You can donate live in the bakery Monday – Saturday until 3pm, or online at greatharvestdenver.com. Thanks in advance for your contribution, and thanks for fifteen great years serving the Wash Park neighborhood.